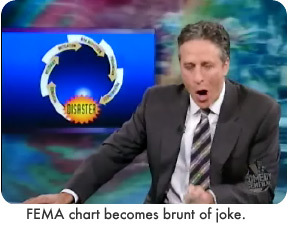 Presentation Zen: FEMA chart becomes brunt of joke. All too often, I find myself confused by a chart someone is using in their presentation. This is ironic since the whole point of going to the trouble of making a chart or a diagram and using it in a presentation is to help facilitate understanding, not create confusion. As Edward Tufte, world-famous PowerPoint critic and mocker of PowerPoint "chart junk" says, at the very least it (PowerPoint) should do no harm. Graphics when done well can help. When done poorly they undermine our messages. Poor design can even become the object of a joke as well. "This chart (below), clearly depicting the agencies responsibilities in the event of a disaster....It begins with a response to a disaster, leads to recovery, mitigation, risk reduction, prevention, preparedness...(dramatic pause) and ends up BACK IN DISASTER!" This chart could give the impression that FEMA's response to a disaster...ends up in disaster. Not what they had in mind when they slapped the graphic together, to be sure. FEMA is an important agency which does very important work. The agency deserves a better "What we do" graphic, and a better overall website for that matter. The chart has obvious design problems. The text labels inside the arrows are difficult to read. For example, two of the five text labels are set almost vertically (RESPONSE, PREVENTION) and the other (PREPAREDNESS), is set almost completely upside down. All upper case type does not help things either. This graphic looks like something an employee who's in a hurry or inexperienced (or both) would spit out in PowerPoint or Word, print, and then tape inside the front window of the neighborhood liquor store announcing 50% off cases of Budweiser. The arrows and the star (simulating disaster) would appear to be run-of-the-mill "Auto Shapes" included in Microsoft Office software. The graphic is ugly, yes. But that is not the real problem with it. The website says that the process begins when "...managers prepare for emergencies and disasters." So the cycle begins with "Preparedness." However, the graphic implies, judging from the "Disaster" starburst auto shape in the center, that the process begins with a disaster and a reaction to that disaster, and then prevention and preparedness sometime later...after the disaster. Is describing what FEMA does really best understood in terms of a cycle, especially a life cycle? When I think of an example of a life cycle I think back to elementary school when I learned about the life cycle of the butterfly. Even a child understands this simple idea with the help of a basic chart: An adult butterfly lays an egg; egg hatches into a caterpillar; the caterpillar forms the chrysalis or pupa ("that sack thingy"); and this then turns into a butterfly. These are stages and we can easily draw a diagram of this kind of perpetuating cycle. Some 30 years later I still remember that chart. Perhaps FEMA would have been better advised to show the stages in a more linear way? Marketing folks, for example, like to show the New Product Adoption Life Cycle in a more "linear" manner, revealing stages of adoption over time in the form of a bell shaped curve moving left to right (see example chart from crossing the Chasm here). I do not have examples of a more appropriate chart, but no doubt there are far better ways to show the various stages of the work FEMA does rather than a confusing "life cycle" that "begins in disaster and ends in disaster." Even with help of live narration, this graphic would not do the best job possible of supporting the speaker trying to convey the message (from the FEMA website): "And at every stage of this cycle you see FEMA...." As a slide it would be inappropriate, no doubt. As a graphic on a website it sends an unintended (or at least confusing) message with no one there to clarify. If you are (were) teaching a graphic design class, it would be quite interesting to assign students the task of creating a graphic that best helps people understand the role of FEMA. No doubt you would get many interpretations. As an experiment, (you could) tell half the students that the graphic should represent "the stages of FEMA involvement in a disaster" and tell the other half of the students to show "FEMA's involvement in the disaster life cycle." I wonder if thinking in terms of "stages" or "a process" (rather than "life cycle") would lead to better designs?